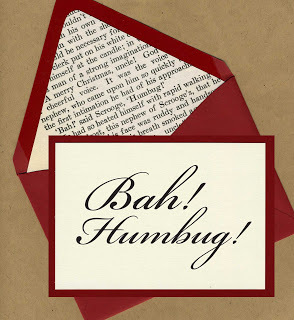 Holiday Picture Book List for 2011! For your best friend: One of my favorite books of all time. “Five stories about two great friends.” These five stories are short and sweet and oh so funny. My particular favorite is about split pea soup. 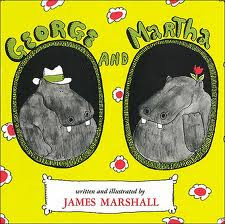 Great read aloud and essential for any picture book library. pearl necklace. 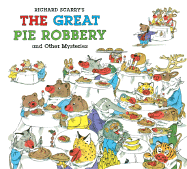 No picture book library is complete without at least one Richard Scarry book. For the reluctant reader: Have you walked into a bookstore recently and noticed someone shaking or flipping upside down the book they were holding, if so they were probably looking at Press Here. This book is wonderfully interactive and gets everyone to participate upon opening its cover. Truly this book is for everyone, but especially a reluctant reader. There is no story, just instructions for what to do. Tullet brilliantly turns a book into a toy. For the gardener: This book was recently named one of the NYT best illustrated books of 2011. A beautifully illustrated story of old and new, past and present, love and loss all told through topiaries created by one boy’s grandfather. I am a sucker for gatefolds in picture books and this one has a double gatefold that is simply lovely. 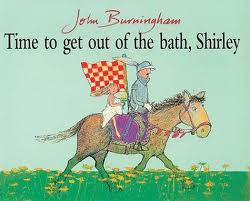 This is a great book for young and old. One of my favorites for 2011. For the bug lover: This is one of my favorite books of all time! Spiders always get such a bad wrap. Now I’m not saying I want to let a hairy tarantula crawl up my arm, but I am one to let a daddy long leg live if only to get rid of the occasional bug in my house. We all have our purpose, which is exactly what this book is about. Even if you’re a bit squeamish around spiders I promise you will enjoy this book. 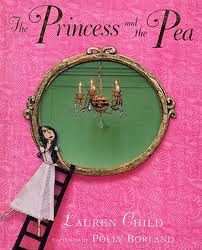 For the princess: Lauren Child is one of my favorite illustrators of all time. She has this amazing ability to capture all that it means to be a child in her illustrations. This edition of The Princess and the Pea was fabulously done using 3D miniatures created by Lauren and photographed by Polly. Each spread is like looking into a dollhouse window, pouring over and discovering every minute detail Lauren has added. I find new things every time I read it. This is an amazing book that not every princess will already have. For the adventurer: I love love love all things Helen Oxenbury. Her illustrations are wonderful! So of course her new book is on my list. 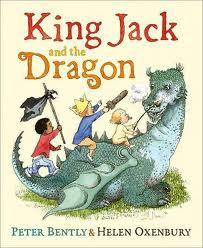 Peter Bently’s imaginative story about Jack, Zack, and Caspar is an adventurous romp into the wild, facing dragons and beasts, and conquering the backyard! A great suspenseful read aloud before bed. For the animal lover: I like to think of this as a modern day George and Martha because it is a picture book of short stories, six in all. Meet Amanda and her lovable, sometimes persnickety alligator, named Alligator. Alligator has a lot of opinions, which is why I love the character so much. This book has the charm of Willem’s Leonardo the Terrible Monster and the humor of the Pigeon books. A perfect book for any child, boy or girl. For the artist: This book involves three of my favorite things: Melissa Sweet illustrations, Thanksgiving, and the Macy’s Day Parade. Another 2011 NYT Best Illustrated Book, Melissa Sweet’s newest book tells the true story of Tony Sarg, the man who became the puppeteer behind the Macy’s Day Parade. The artwork is absolutely stunning! 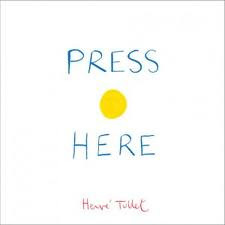 A great non-fiction picture book for any creative child on your list. I hope you enjoyed my list and maybe you’ll pick up some of these books for those on your list this year. Remember, pictures books stay with you always, even when you finish growing up. I know I still remember ones I received as a kid. Good morning and Happy Pre-Turkey Day!! Thanksgiving is my absolute favorite holiday (mainly because of stuffing and pie). 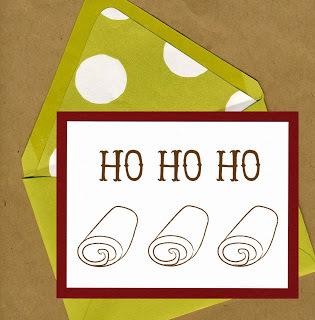 This year I am going to make a recipe from the Flour Bakery cookbook (my favorite Boston bakery). Blueberry Lemon Pie. Doesn’t that sound tasty and fantastic?! I know it is a bit summery for Thanksgiving, but sometimes you need a little variety to go with all the pumpkin pies. I love this holiday because it is the one time of year where sweatpants (elastic waistband included) is appropriate attire. 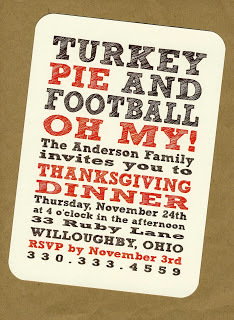 When it comes to Thanksgiving I have one motto: Go Big or Go Home! Needless to say, I will be eating a lot tomorrow. But my favorite part, oddly enough isn’t the big dinner, it’s the part before hand, the preparation. I love spending the morning in the kitchen baking and cooking, tasting bits here and there, spending time with friends and family. Those are the best parts. Unfortunately, I can’t even remember the last time I was home for Thanksgiving. In college it was too far/expensive to fly from Syracuse, New York to San Jose, California in such a short amount of time, so I was adopted by various friends and brought home to eat their traditional dinners and meet their families. I’m lucky to have amazing friends, who happen to have really good food at Thanksgiving. In college, I usually went home to Schenectady, New York with one of my dearest friends, Kait, whose mom makes everything from scratch, even the butter. The whole family would alternate shaking the mason jar with heavy cream inside throughout the day until it became butter. Kait’s mom’s menu also included two key items: mashed potatoes with cream cheese (you just have to try them to experience the gloriousness) and stuffed artichokes, the family favorite. Let me preface this by saying how rare it is to come across people who make artichokes on the East Coast. It is definitely more of a West Coast thing, so you can understand how me, the California girl, felt right at home at Kait’s house for Thanksgiving. Plus the stuffed artichokes are absolutely outstanding! But it wasn’t just the food that I loved about Kait’s, it was her family and the feel of their house, so cozy and welcoming. The house creaks when you walk down the hall and when you wake up in the morning the first sound you hear is Kait’s brother playing the piano. And not just fooling around playing, but like “I’m a music major and amazing” playing, it was wonderful (although after years of this I’m sure Kait and her family felt differently some mornings). I loved that house because it had so much character. It was the perfect place to spend Thanksgiving when I couldn’t be with my own family. Now, I spend my Thanksgivings with my boyfriend Frank’s family here in Ohio. Lucky for me Frank’s mom is one of the best cooks I know. Her food is AMAZING! We usually end up over at his aunt’s house for dinner after I spend the morning cooking and baking with his mom. And it is perfect, my favorite part of the day. I doesn’t hurt that she is one who makes the stuffing too (which I get to taste test in the morning). 1. I love to chop, peel, and mash, which means all those time consuming tasks that no one wants to do I will. 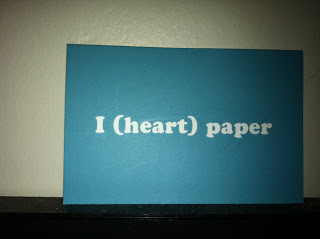 I assume this has something to do with the fact that I like to do painstaking tasks like cutting tiny bits of paper out. 2. I don’t cry when I cut onions. It’s my superpower. I have been collecting random antique children’s books here and there over the past couple years and realized I just don’t have space for them, thus creating Chicken & Bear Books, my new Etsy shop for vintage children’s books. As noted in my previous post my studio is very small, which you can imagine reflects the size of my house as well. Most of my books (some 30 boxes mostly adult, YA, and middle grade) went into storage when I moved into this house. It was very hard to part with them. All I have left in the house are the library books I am currently reading and my collection of children’s picture books. Upon moving I pleaded that those were the ones I needed the most and therefore could not live without, needless to say I won my case. I am now accountable for moving all the boxes full of books every time we move, but to me it’s definitely worth it. After posting my new shop yesterday, I got to thinking about home libraries and what people do with all their books, especially in small spaces. I have a tenancy to let books just pile up around my nightstand, creating rather treacherous mountains to skirt around while crawling out of bed in the morning…leading to many stubbed toes and tumbles. But yet I won’t move them. There is comfort in their surrounding. 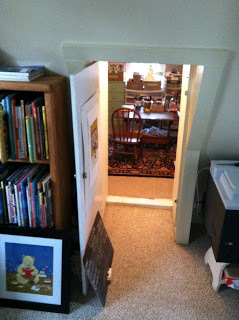 When I lived in Boston, the piles where everywhere, spilling off of shelves, drawers, and stacked high against the wall. Thankfully for my feet I have scaled back a bit. I recently read an article about the twenty best home libraries, most of which were owned by celebrities of course. Because who else has the money to have a whole room devoted to their books with those amazing ladders you see at Strand Books? It made me wonder about other book lover’s libraries. What do they look like? Do they sort them alphabetically like I do? Do they break them down in to sections: picture book, YA, adult, middle grade, non-ficition and so on? Or are the books just piled together at random? Are their comfy chairs to sit in? I have friends who live in New York who say that if they buy a new book they have to get rid of an old one to make room. Space is obviously a very precious thing in New York so this is understandable however tragic it may sound to me. Anyone out there with a library they have created in some corner of their home? I would love to hear about it. 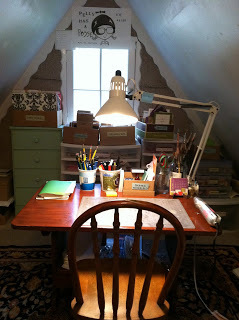 I have been thinking a lot about my studio space lately, mainly because I am about to start a new book, and every time I begin a new project I go into ‘Scary Type-A Dinosaur Mode.’ I want everything to have its perfect place, with a label of course, and maintain a neat and tidy appearance. 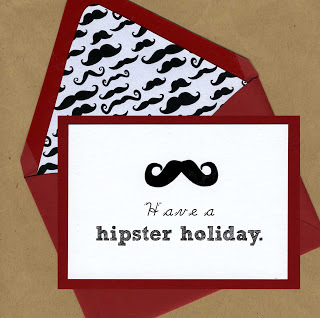 I have determined that the only reason that I go into this mode is because of my medium, cut paper and mixed media. 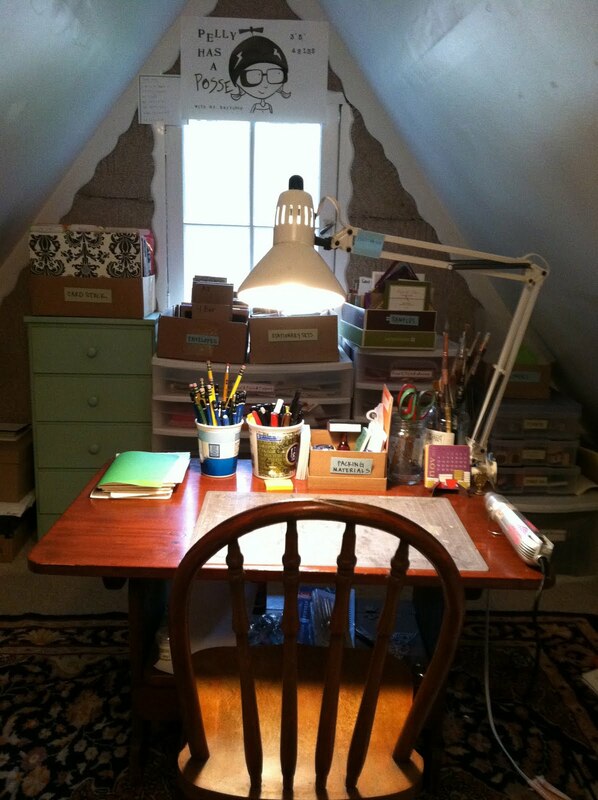 For someone who is as much of an organizational freak as I am, you would think I would pick something like colored pencils or pen and ink: minimal clean-up and an overall tidy work space. But no, when I start a book, I begin to hoard paper. A lot of paper. So much paper that by the time the book is finished it looks like a paper bomb went off. There are scraps everywhere! In fact, I distinctly remember going to dinner one night while I was in the midst of finishing A Garden for Pig, and a friend of mine removed a scrap of paper from my hair, which is curly, but still paper should not be nesting inside of it! 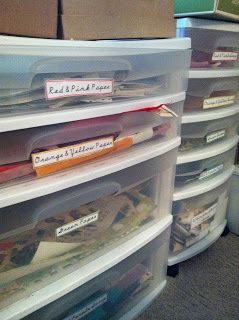 Needless to say, my studio space is filled with lots of paper in all shapes and sizes. When I moved in May, to the house I currently live in, I acquired very small studio space upstairs. In fact if you are over 5’7″ you will not fit in it. This can behelpful when I need to get work done and therefore physically excludes people from being a distraction. I like to think of it as my Alice in Wonderland studio. Every time I go in it I think of the scene when Alice grows so rapidly her arms and legs go flying out the window as she can no longer fit inside the house. 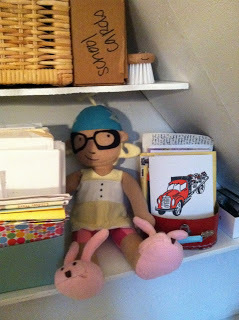 So I thought I would include some photos of my very tiny, Carroll-esque studio space. This is the very small entry way to my studio 🙂 Notice the hobbit size requirement in order to get in. 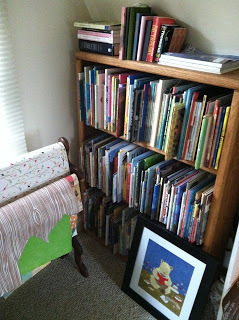 My ever growing collection of children’s picture books, all of which I love dearly. And of course, a place for Pelly. Although my studio is very small, and I hope to have a larger space in the future, I love how cozy it is. And most importantly, I have been extremely productive in it since I moved, so here’s to small spaces and being creative. Is It Really November Already?! It has been shameful how long it has been since the last time I posted on here! I am definitely one of those people who started my blog as a way to keep being creative and discussing the creative process, but of course have the horrible habit of forgetting to maintain my blog. Well I’m back, sorry it took two months! My wonderful agent Mary Kole came to town for a SCBWI conference here in Cleveland. It was so great to see her! One of the things that no one ever tells you when you get involved in the business of children’s books is that you don’t get to meet most of the people you work with on a regular basis, especially if you don’t live in NYC and aren’t able to go to conferences. Mary has represented me for just over 2 years and that was the third time I have ever seen her. So needless to say it is a treat to see her in person! I also had the opportunity to meet Andrew Harwell, who now works at HarperCollins as an Associate Editor, but when I met him (via email of course) he was still working at Dial Books for Young Readers at Penguin. When I sent in some of the final artwork for Blue, it was temporarily misplaced, which you can imagine gave me a mild heart attack! Andrew tracked it down and made sure it arrived safely to Penguin. For that I will always be thankful. Andrew was absolutely lovely and it was so wonderful to meet him in person! Next, my mom and step-dad drove 2,700 miles from San Jose, California to Peninsula, Ohio. They are crazy for driving that far!! I don’t think I could ever be in the car that long. But it was so great to see them and spend some time together. My mom, who I have posted about before because of her gallery of tattoos that feature my book characters, finally got to see the F&G for When Blue Met Egg. I dedicated the book to her, which she didn’t know, so it was really special to be able to show it to her in person. My first gallery show! So cool! 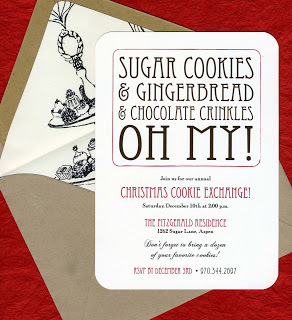 There is this amazing gallery here in Peninsula, The Log Cabin Gallery, that does seasonal shows with all local artists. They have a winter show opening next week which I highly recommend checking out if you are in the area. I did not feature any originals from my books, but I did have four original pieces hang, one of which sold, as well as a bunch of books. When I brought my framed originals in, Diane (who owns the gallery) asked me why I didn’t sign the pieces before I framed them. I just looked at her and said “I’m an children’s book illustrator, we don’t sign the originals.” It never even occurred to me! Shows how much of a fine arts newby I am! It was so much fun to be a part of and to meet all the other artists who work in the area. Hopefully I will have the opportunity to show there again in the future.